I was planing a piece of mango wood for a coat rack I am making, when I got completely sidetracked by something. The shavings were so pretty, the urge struck me to try making a ring out of them. I have never made a ring before, and for the past 24 years I have only worn one ring, my gold wedding band. I’m not exactly a jewelry guy. Odd as this inspiration was, I stopped the actual project I was working on, to try making a ring. Sometimes you gotta follow your muse. I grabbed a AA battery. It seemed to be a close approximation to my finger. Then I started wrapping blue masking tape around it until the diameter matched the inside of my wedding band. Then I wrapped it with one small piece of cellophane tape to hopefully prevent the super glue from sticking to it. I looked through the pile of mango shavings and started pulling out any that were solid and had no broken sections. Then I started wrapping one around the taped up battery. When the shaving started to overlap itself, I added a bit of superglue… err CA glue. I kept adding glue and winding. I’d take a break to let the CA glue cure, then continue on. 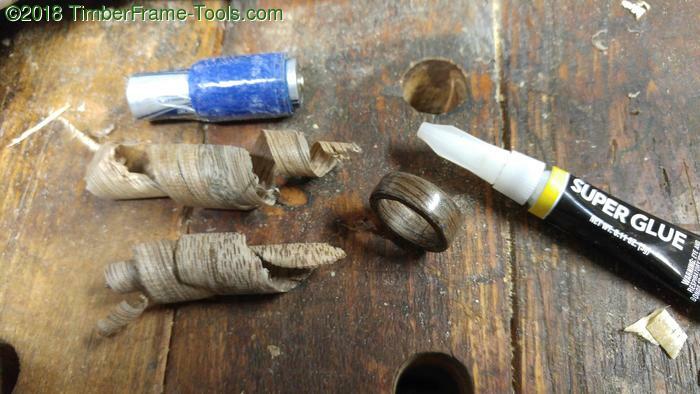 Wood shavings, some painters tape, an old battery and some super glue produce a nice ring. Before long I had a fairly decent start of a ring. When I thought it was more than thick enough, I decided to stop adding more shavings and I slipped it off the battery. The ring was also plenty wide and had some pretty ragged edges. 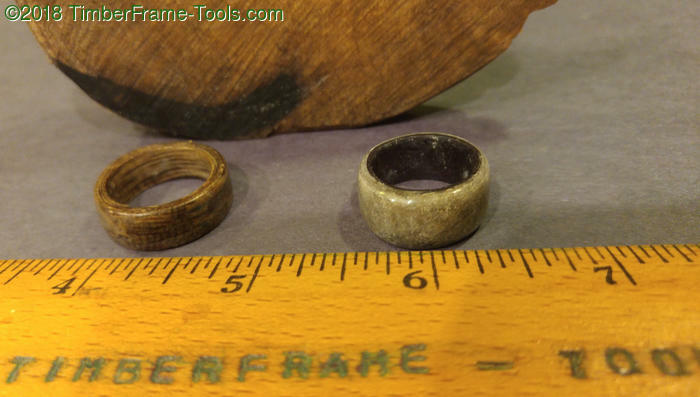 I took the ring and sanded the edges on a piece of 100 grit sandpaper attached to a flat surface. Without much effort it was narrow enough to be a ring. The edges had some gaps where the shavings were not as tight as I wanted, so I filled those in with more CA glue. An old tapered grindstone made a decent ring mandrel. 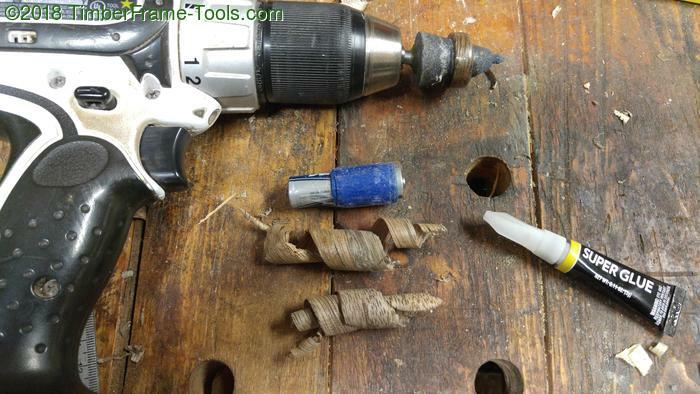 To shape and polish the ring, I placed it on an old tapered grindstone and put it in my cordless drill. With this setup I was able to spin the ring and apply fresh coats of super glue, then sand some more. I worked my way up through the grits to 2000 grit. The end result was a pretty looking ring… err I mean handsome ring. The grain of the mango is amazing. I wore the ring for a few days, then took it off and went back to being just a one ring kind of guy. I had followed a whim and enjoyed it. Now it was time to get back to work. A month or so after making the mango ring, my son and I were watching a youtube video about making a knife-handle with epoxy and cat hair. The idea lit a fire in my son’s head and he wanted to try something involving cat hair. He decided he wanted to try making a cat hair ring. So we used a similar method involving wrapping tape around a AA battery until it matched the size of his finger. Then we a strip of black construction paper as the first few layers of the ring, held together with super glue. He brushed his cat a few times to get a bunch of cat hair. Then we teased it out and created thin layers of cat hair, that I stuck down with super glue. After we had several layers build up, I chucked the battery in my drill press and started sanding. 80….120……220 grit. Then I applied more layers of super glue. More sanding on the drill press. When it seemed to have enough thickness and a solid surface, I took it off the drill press and sanded by hand at the edges on sandpaper stuck to glass, untill the edges of the ring were crisp parallel. I then put it on the tapered grindstone and started finer sanding followed by more layers of superglue. When it seemed solid with no voids, we stopped putting on super glue and processed sanding up through 2500 grit sandpaper. I finished it up with an application of paste wax. The mango ring is on the left and the cat hair ring is on the right. Behind them sits a mango offcut that I shaped and shaded to look like a cat. The appearance surprised me. The cat hair ring does not look like cat hair. It looks more like marble or some kind of stone. Only under a magnifying glass can you see the hairs that make up the ring. It may be a little creepy to think about a ring being made from cat hair, but the end result is pretty nice. 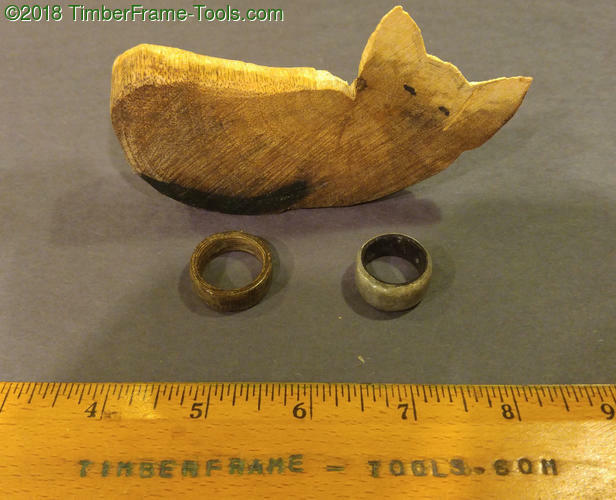 Ring from mango wood on the left, cat ring to the right.